• In the aftermath of the LARGEST one day drop in gold, many of you are asking what's next for the so-called "safe haven". The best seat in the house is from the sidelines, but here are our thoughts. All markets are subject to emotional trade, but the precious metals markets tend to be among the worst offenders when it comes to exuberance. This is true in both a bull and bear market; even worse, occasional chaos can be exaggerated by margin calls because a substantial amount of gold trading is done on leverage. Even unleveraged gold ETFs backed by bullion are not immune from the impact of margin call selling because the two markets are tied together. Further, gold is one of the few commodities in which its supply and demand fundamentals are not largely based on consumption; instead, the need for gold is a primary function of fear, skepticism, and greed. It is worth noting the fundamental landscape before we dive into the chart work. As the global economy works its way out of the financial crisis, the luster of gold has faded as an alternative currency or a means to hedge against a system failure domestically or abroad. In addition to decreasing demand at the hands of waning economic risks, the supply of gold is on the rise putting pressure on prices. This is not surprising; as is the case with all extracted or grown commodities, higher prices lures additional production. From 2008 to 2011 the total world gold mine production increased by about 15%. However, demand continues to outweigh supply, giving the bulls a long-term edge despite short-term weakness. Goldman Sachs issued a bearish recommendation on gold last week, and the market immediately reacted. In our opinion, a move under $1,500 was in the cards prior to Goldman’s analysis being released, but it certainly seems to have sped up the process. Goldman’s downside target was $1,450 per ounce; this level turned out to be the starting point of the accelerated selling rather than the end and will likely act as resistance on the way back up. After Monday’s bloodbath, we suspect most of the reaction to the Goldman report is accounted for. Nonetheless, seasonal pressures remain overall neutral to bearish in this market for the next few weeks, so there could still be some follow through selling before a longer term bottom can be formed. Until now, the Fed’s Quantitative Easing program has avoided a complete collapse in gold pricing compliments of amped expectations of inflation and devalued the U.S. dollar. Nevertheless, indications that QE could be winding down helped to pull the rug from under pricing in recent sessions. In the coming months we feel like the major driving force behind gold prices will be inflation, or the speculation thereof. Although inflation hasn’t reared its ugly head yet, traders will likely anticipate it to be a risk going forward due to the current monetary policy. Once panic subsides, this should keep some sort of floor under gold pricing. We often look at the CFTC’s Commitment of Traders Report for information on which groups of traders are playing the market in which direction. The C.O.T. Report typically isn’t quite as useful in gold analysis as it is some of the other commodity markets simply because speculators, both large and small, are almost always net long gold. However, we did find some rather valuable information in the latest reading; the large speculators, who are assumed to be the “smart money” but aren’t always on the right side of the trade, are holding the smallest net long position since mid-2012. On the last occasion that this group has been so mildly bullish, gold prices made a run from about $1,530 to $1,790. In our view, this stat leaves plenty of room for the market to move on the upside once the selling is exhausted. Going to a weekly gold chart, we discovered that the recent sell-off has caused the RSI to dip below 30 for the first time until well before the financial crisis. In fact, going back a decade we couldn’t find an instance in which the gold market was more over sold than it is now; at least according to what is typically a relatively trusty RSI (Relative Strength Index). Gold prices have fallen precipitously in recent sessions, but one man’s pain might be another’s joy. 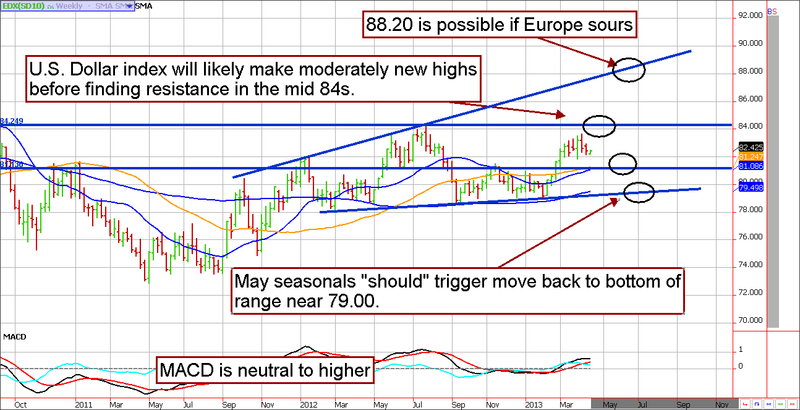 Long-term gold bulls might find opportunity in getting bullish gold at highly discounted prices. 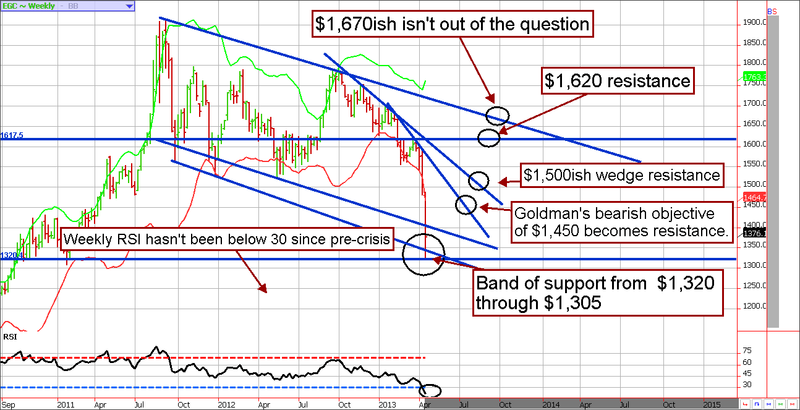 Our charts suggest strong support near $1,320, which held in overnight trade, and psychological support near $1,305. We expect these levels to hold for now, but we can’t rule out a retest of the lows or slightly new lows to the $1,285 area. Although catching the falling knife is a dangerous game, it appears as though prices are becoming attractive as a value play. With that said, don’t let the “safe haven” description of the gold market fool you; any speculative play in gold should be reserved for a small portion of your trading capital, both the risks and the rewards are super-charged in this market. This is not a market for the faint of heart! Assuming support near $1,320 through $1,305 continues to hold, a routine bounce back from oversold levels would mean a run to about $1,450. This is approximately the downside target issued by Goldman Sachs, but is also the sharp down-trend resistance line. If this price is penetrated it, which we eventually expect to the be case, the oversold bounce becomes something more. We suspect momentum could trigger a move to wedge resistance near $1,500. Should prices break this level, it could be off to the races toward $1,620. Although we aren't counting on the rally to see $1,670 it certainly isn't out of the question based on the current down-trend channel. When attempting to predict the future price of gold, it makes sense to perform similar technical analysis on the U.S. Dollar. Because gold is priced in dollars, the two markets tend to trade inversely more often than not. It should be known that the current degree of negative correlation, as measured by the previous 180 trading days, is 66%. In other words, while there is a strong negative relationship they are not perfectly negatively correlated. Nevertheless, the direction of the dollar will impact gold prices and the dollar chart appears to corroborate the possibility of looming gold support, and possibly even a reversal. The MACD (Moving Average Convergence Divergence) is one of the slower moving oscillators and can be used to identify trends and possibly waning momentum. The MACD lines continues to point higher for the U.S. dollar, which tells us a new high in the greenback is in the cards. However, the lines are also beginning to taper to a more neutral stance which could mean the upside in the dollar is limited. In our best estimation, we feel like the mid 84s in the dollar index will hold and entice trade to weaken toward the lower end of the trading range. If so, this should be supportive toward gold prices, and other commodities for that matter. Assuming we are right, look for support on the way down near 81.15 and again near 79.30. If you "must" play this treacherous market and want to hold a position for a long-term or swing trade. We suggest you consider using the e-micro futures contract. The e-micro futures makes or loses $10 per $1 price change in gold. Profit and loss can still add up in a fast moving market, but the decreased leverage will be welcomed if volatility remains elevated.